One of the great points of living in the 21st century is having the widest range of learning and listening to other opinions and voices than any other point in history. Normally, you’d have to read about what others thought about a movie through your local newspaper or by reading a critic’s book. I bring this because I learned something about Guillermo Del Toro’s most recent film “Crimson Peak” that I would not have known otherwise – That it is an homage to Italian horror cinema from the 1960s and 1970s. From the gothic landscapes, to excessive violence, to even outlandish plots that normally involve ghosts and spirits, “Crimson Peak” was meant to be a modern-day addition to those classic horror films. Outside of Quentin Tarantino, it comes across like Guillermo Del Toro is the biggest movie buff in the film industry. Each of his films pay tribute to a genre that he adored, like “Pacific Rim” and the giant monster genre. His films emulate what makes those genres so great, while also making it accessible to those who may know nothing about these films. And “Crimson Peak” is no different, as long as you don’t mind lots of violence and disturbing plot lines. 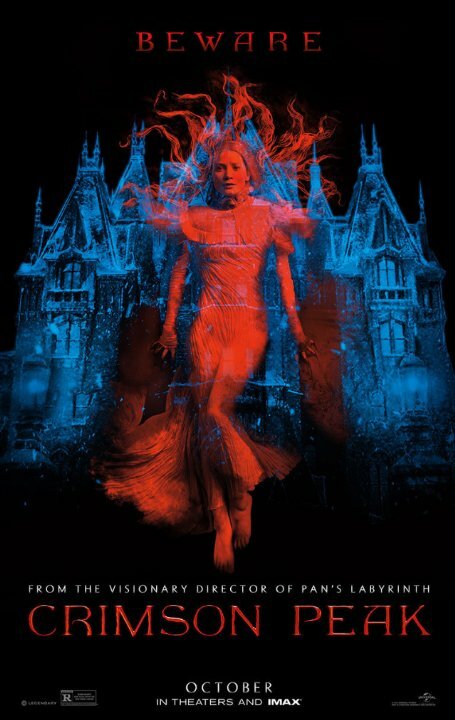 Set in the early 1900s, Edith Cushing (Mia Wasikowska) is a budding young writer in Buffalo, New York, but is haunted by the spirit of her mother, constantly warning her about “Crimson Peak,” even though she’s never heard of it. But when Sir Thomas Sharpe (Tom Hiddelston) visits, inquiring about funds for a project he is constructing back in England, Edith is infatuated by him and the two hit it off. After some strange looks from Thomas’ sister, Lucille (Jessica Chastain), it seems like Edith will do anything to be near Thomas, even move back into his slowly disintegrating mansion across the pond. 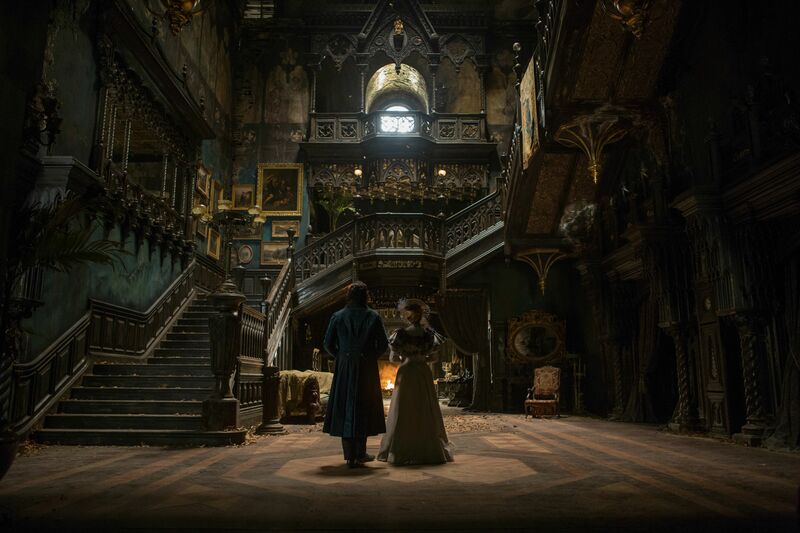 If you’re going to watch “Crimson Peak” for anything, watch it for the visual style. Once the film reaches the mansion, the house takes on a life of its own. The house rests on top of a fine red clay, but this monument to time long since passed is so far gone that it is sinking into this muck, as if the house is bleeding. With every step these characters take, the clay oozes from underneath, and can almost always be seen coming out from a nearby wall. Anytime the water is turned on, the first bit of it is red. It is as if the house has seen too much and is crying out in agony. There is a gigantic hole in the middle of this mansion, where the seasons pass on the ground. Leafs fall below, even though there are no nearby trees, and a fine snow collects during the winter months. 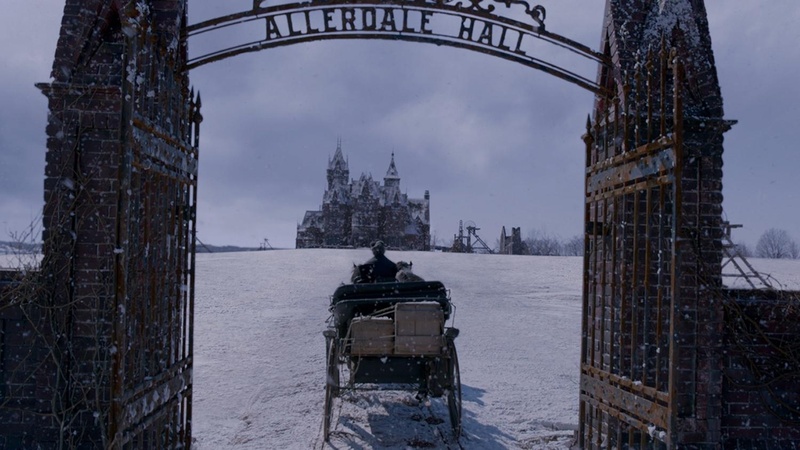 There are many scary aspects to “Crimson Peak,” but the atmosphere alone is to die for. I’m reminded of Tim Burton’s “Sleepy Hallow,” which was another tribute to a group of horror filmmakers – in that case, England’s Hammer brothers. Both “Crimson Peak” and that film share a similar color palette, most characters and backgrounds are desaturated and look either pale or bleached, as if it had been out the sun too long. But one color remains untouched – red. “Crimson Peak” loves red and wants to showcase how bright and colorful it can be. Not just the clay or blood, but the many ghosts throughout the film are stained in red. Because everything else is so bland to look at, anything that is red stands out so much more. In a way, this is Guillermo Del Toro’s most beautiful film so far. Like I said earlier, “Crimson Peak” is not a film for the faint-of-heart. They go into graphic detail on each ghost and how it got to looking like it did, and many of the characters do some despicably violent acts, with Lucille being the biggest culprit of them all. I won’t go into detail, but let’s just say I still feel dirty even after watching it. So if that makes you sick, this is not the film for you. But if you like gothic horror tales of ghosts, ghouls and haunted mansions, as well as passion projects to a long forgotten form of cinema, then “Crimson Peak” is right up your alley. Though the film is short on story and does take a while to get going, there is no denying this is a visual thrill ride.